WNA got the chance to talk with the cast and showrunners of Midnight, Texas at San Diego’s Comic Con. The show will be returning Friday, October 26th at 9/8c on NBC and if you thought last season was crazy, that was only the beginning of the drama for the denizens of Midnight. There will be new faces: Nestor Carbonell and Jaime Ray Newman will be playing Kai and Patience Lucero—the operators of the newly refurbished hotel and health retreat located in Midnight. Manfred (François Arnuad) will be drawn to Patience, which considering she’s married should be interesting to say the least. The newest couple arriving to Midnight won’t be the only ones with strains on their marriage. Also joining the cast will be Josh Kelly as Walker Chisum a demon hunter that grabs the attention of Joe Strong. Hopefully the new marriage of Olivia (Arielle Kebbel) and Lem (Peter Mensah) will not be fraught with temptation, though I’m sure there will be plenty of drama between them. Same goes for Bobo (Dylan Bruce) and Fiji (Parisa Fitz-Henley)—after last season they need a little respite. Marriage is hard–it might be a little harder when one of you is a vampire and the other is an assassin. Arielle Kebbel and Peter Mensah tell us what to expect this season with their newly married couple. Manfred will be suffering some lingering effects from letting those demons possess him last season–will he be this season’s big bad? Joe spent years hunting demons, that is until he fell in love with his husband half-demon Chuy (Bernardo Saracino). When Walker Chisum comes to Midnight, repressed urges might resurface. Fiji and Bobo consummated their relationship to save the world, but they have been best friends for a long time and I can’t wait to see how their story unfolds this season. Season one went through a lot of source material, but that doesn’t mean there aren’t new stories to tell. 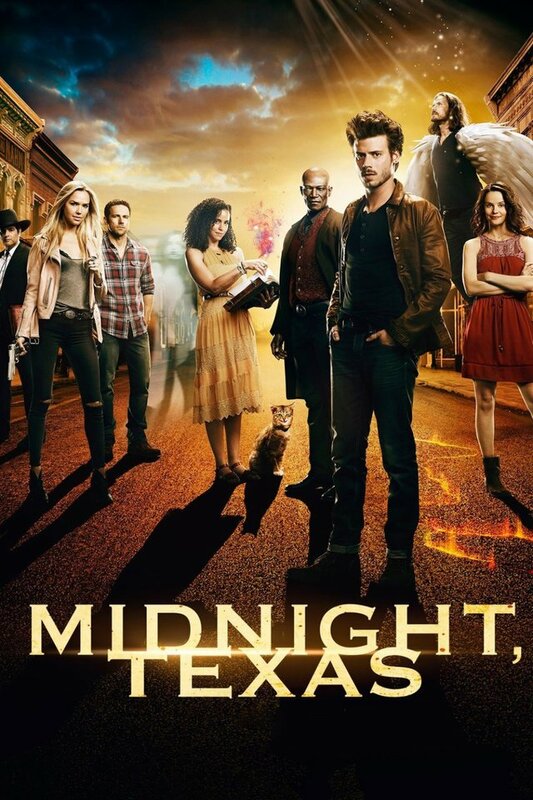 Written or on screen Midnight, Texas offers a great cast of characters and a small town where, “only outsiders fit in”. Season two airs in October so if you haven’t watched the show, you have plenty of time to catch up–the show is definitely worth a watch or two!